As part of our English this term we are looking at the story of ‘The Secret dinosaur’ which is set in a museum. So Year 2 children had the experience of a dinosaur museum in school. Year 2 meet the dinosaurs! First day of the term and the year 2 children came face to face with the ferocious dinosaurs. They learnt lots of amazing facts about the ginormous creatures and their eating habits. The children were brave enough to stroke Topsy the triceratops who was only 2 weeks old. 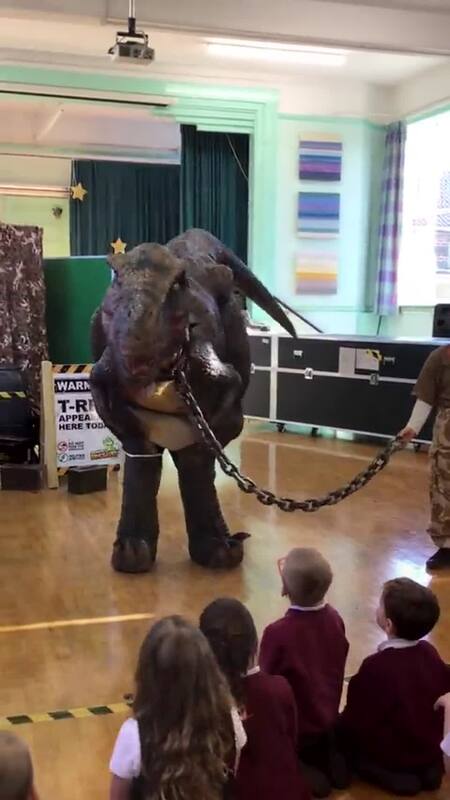 Some children felt very nervous meeting the T Rex even though he had had his lunch they were still worried he might get hungry. On Monday the children were looking at the features of maps and what they are used for. They had time to explore the maps and identify things the children noticed. In year 2 we have been looking at instructions. We followed a set of instructions to make some delicious moon rock cakes. Year 2 are loving the yummy space treats that the children are bringing in as part of their homework! They all look fantastic! In year 2 we have been investigating materials. We were finding out which material would be best to make a cup for Andy the Astronaut to take to space! This term we are learning about ‘Who’s out there?’ for this we look into what happens beyond Earth in space. Year 2 were amazed by the space dome experience on Tuesday. They got experience what it would be like to be an astronaut. 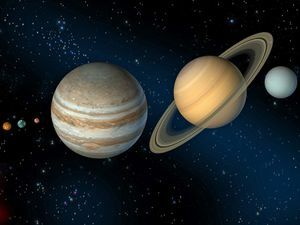 When returning to class their minds were bursting with facts they had learnt about the planets. What an amazing way to start our new topic ‘What are we marching for?’ the children in Badger class looked amazing in their outfits. We made our own salt dough medals and created a range of poppies using different materials. We were very lucky to have a visitor to share with us his artifacts and talk about it. What a busy first term in Year 2 we have been explorers at the Zoo. We loved learning about Captain James Cook and the adventures he has been on. Wow what a week we have all had, it’s been brilliant! We had a musical start to the week with a music road show, we clapped and danced along to the beat and at times we even had a good sing song. We then got into our busy Sports Week; we have taken part in football, holiday club, boxing and rugby. In the middle of the week we had our sports day, we loved it when our grown-ups joined for a picnic and then cheered us all on in our races. In the afternoons we have been busy with our rehearsals for the leaver’s assembly and we are looking forward to our grown- ups coming to watch. We had a fantastic time at Bowood after all of our hard work in year 2. Thank you to all our adults who support us and we look forward to our last few weeks at Grange Infants school. This week in Year 2 we have managed to catch some of the dry weather and enjoy some outdoors activities. In Science this term we are learning all about plants, this week we have been out exploring the outdoor environment to see which plants we could identify. We found bluebells, tulips, daffodils, daisies and pansies. For our PE this term we have been learning to work as part of a team and testing out our ball skills. In English we have been writing instructions. We loved getting our fingers dirty following instructions to plant sunflower seeds. We then wrote our own set of instructions for our friends in Year 1 and EYFS to use. Last week we were learning the story of ‘Jack and the beanstalk’; we learnt actions for the different parts of the story and we then retold the story to each other. We had the most fantastic experience! We got to meet Topsy the baby Triceratops and a fierce T-Rex! The dinosaur team told us lots of interesting information and we practised moving around like different types of dinosaurs. We made dinosaurs out of clay. We created different patterns and textures on the clay and studied pictures of dinosaurs to make our model look as real life as possible. We enjoyed making bags for Mothers Day last week. We were thinking about our Mum's favourite things and drawing them onto the bag. We hope you liked them. Will the longest dinosaur fit in our playground? We are learning lots of information about dinosaurs this term and we were really excited to learn that the longest dinosaur was 58 metres so we went outside to see if it would have fit in our playground. We were even more excited when we discovered that it would have fit, we couldn't believe how long that dinosaur would have been! In maths we were learning how to measure in grams and kilograms. We chose different items from around the classroom and weighed them. we then read the scales to see how heavy they were. Mrs Sperti didn't recognise us the next day when we returned in our school uniforms. Our World Book Day Outfits were fantastic. Thank you for everyone's efforts. We enjoyed having our loved ones from home coming into school to see how we learn our times tables. I'm sure we taught them a thing or two! We have been having lots of fun in year 2 this week because it is Science Week! We put our hands in cold water to see how long we could keep it in for, then we put blubber on our hands to see if it kept our hands any warmer. We started the week with the exciting space dome, where we got to see what the future may hold with astronauts going into space. We have had great fun this week, as part of Science Week we have been investigating how to make things float. Last week we were following instructions to make our own moon rock cakes. Then we got to taste and evaluate them. YUMMY! We were lucky enough to have the space dome visit us this week to launch our Science Week. We went to space and looked at all of the planets and identified different star patterns. Then we looked around a space station and watched Neil Armstrong land on the moon. It was as if we were there! Wow, Term 2 completely whizzed by! We were so busy in Year 2 and we had so much fun in our learning journey so far this year. As part of our topic we were learning about Florence Nightingale and Mary Seacole and why they are so important. In Maths last term Year 2 learnt to tell the time to the nearest 5 minutes we had to practise telling the time to quarter past and quarter to the hour first. We had great fun creating our art work for the Art gallery and were very proud to show off our work to the grown-ups and peers at school. In the run up to Christmas we were very lucky to have so much going on. We watched a performance of Beauty and the Beast; we loved singing along to the songs and clapping along. For Badger class they thought the best bit of the term was meeting Santa, although we had to wake him up as he was so sleepy from his busy job. Year 2 were very lucky and had a special visitor come and talk to them. They had a visit from someone who works in Swindon hospital in the X-Ray department so they could hear all about what happens when you have an X-Ray and they had a look at some photos of different body parts that had been under an X-Ray machine. What an amazing start to Year 2! We started the year off out on the field with our friends. We designed and constructed a home for an pixie only using resources available in the natural environment. We ended the week with PE with Mr Hicks we were very excited to find out that we would be learning how to fence. Last week was a very busy week in Badger class. At the start of the week we had fun learning to work together with team building games. We had to work together to get the hoop all the way around the circle without letting go of each others hands. In Science last week we were looking closely at frogs. We got sticky with the play dough creating a model frog. We then compared the living frog with the one we made. As part of our topic lots of us have been creating fantastic models for our homework! Miss Castle has been amazed by the hard work and effort. Rabbits Class had the fire safety lady come in to talk to us about what we should do in the case of a fire. We learnt to 'stop, drop and roll', we practised ringing 999 for help, we dressed up in firemen clothing and we heard the sound of a fire alarm that we should check are always working in our homes. Rabbits Class have been preparing to write a recount of our Bristol Zoo trip this week. We produced a story map to remind us the order of the day, then rehearsed it with actions and orally rehearsed some fantastic sentences with time connectives and noun phrases. Badger class loved the school trip to Bristol Zoo on Monday. We explored all the amazing animals around the Zoo and looked at the continents that they came from. The children were so well behaved and made the adults very proud. We have done lots of fun learning about the animals this week including placing them on a world map. We are enjoying practising our archery and fencing skills with Mr Hicks this term. ON GUARD!